I should add that I enjoy collaborating on new projects if anyone has a fun idea! Over the last year, I've been thinking about where to take this hobby next, as I feel like I've *done* topographic prints of planetary surfaces. One area of interest is in dynamic models, or really cool things that move. 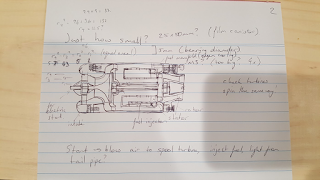 But the first completed dynamic project is, I'm happy to say, a conditionally functional jet turbine engine about half the size of my thumb. 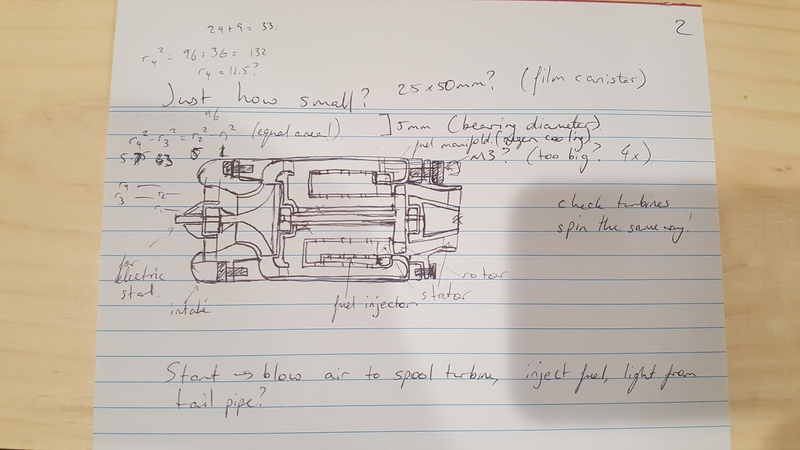 In designing this engine, I drew heavily on model jet engines employed in expensive RC planes (such as https://www.youtube.com/watch?v=DPGDAZyQ44k), but working out how to contract the size by another factor of 4 was a real challenge. I felt that if I could fit the entire thing into an old school film container, that would be cool. I remember thinking about jets of that size when I was about six. This is the last hand sketch I made before switching to CAD. This design, the size of a film container, had internal fasteners and the fuel manifold near the rear turbine shooting forward, as well as some nozzle guide vanes which sadly were overlooked in the final design. It included the two part drive train with a central bearing to enable assembly, though. 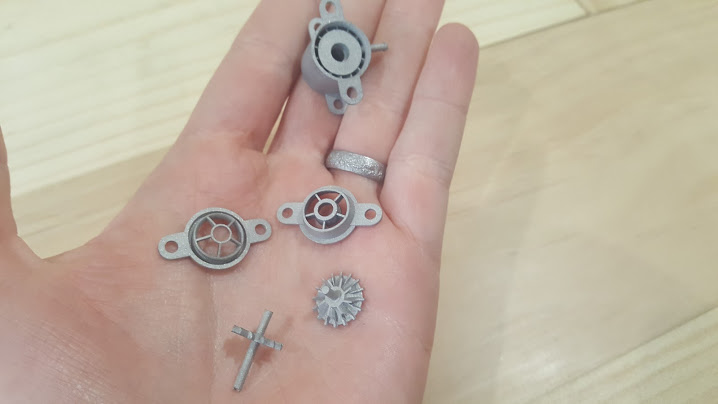 Later, I realized I could make it less than an inch long, while staying within the material requirements of i.materialise's high definition stainless steel. They raised an eyebrow when I asked to print it, but it came back almost completely as expected. There's always some thermal deformation during sintering, but nothing that can't be fixed with a bit of force. Small size is also important because of cost. 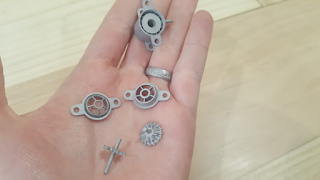 These parts cost about $250 to print, and cost scales up with the cube of size. Film container size could cost $1000! I performed CAD work using OnShape, a free in-browser CAD program that is similar to solidworks. The final design had 5 3D printed pieces, plus three teeny tiny bearings, and is held together with four axial M3 bolts and nuts. 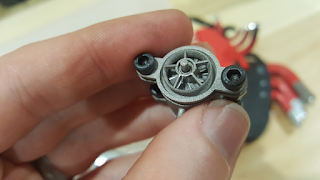 This 3D printed material typically comes with about 20 microns of "fluff" or rough unfinished extra surface. For the convex pieces I removed this in minutes with a drill and a file. For the concave pieces, I cursed my stupidity and went at it with the wrong dremel tool for hours. Eventually I was able to make it all fit together, and turn freely. I had to use some model wire to make the world's worst gasket to seal the "compressor" section, which had retained about a mm gap even after all the fitting work. Precision manufacturing, this is not. But let's not kid ourselves - this is a keyring fob first, and slightly functional demo second. 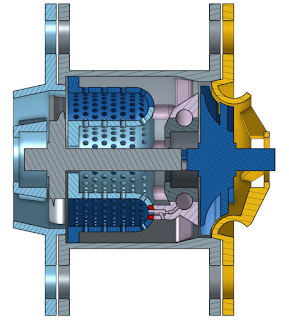 The lax tolerances in the compressor stage alone render it miraculous that it actually moves air in a particular direction. During test I spooled up the compressor with canned air, and separately tested the combustors without any of the nozzles or rotating parts. For final system test I decided to apply the old maxim "Don't try this at home. Try it at a friend's place instead." Particularly since the friend in question (@risknc) had awesome cameras and an air compressor I could use to spool up the rotating part, while handling fuel and ignition separately. This picture shows the final test before I disassembled the test stand. Here, the wooden block is charring, which greatly simplifies the re-light procedure. Fuel was delivered from a butane refill bottle and a long hose. During operation the flow of fuel did manage to keep the system turning, and as we got it dialed it we did see some combustion occur inside the engine. 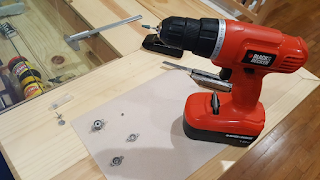 Several design flaws were already apparent, in addition to the bearing housings being too small. The engine operates naturally in "flame out" mode, but the fuel injector doesn't introduce enough turbulence to keep the flames in the actual engine. I found it difficult to operate the engine sufficiently lean - a better fuel pressure regulation system is in order. 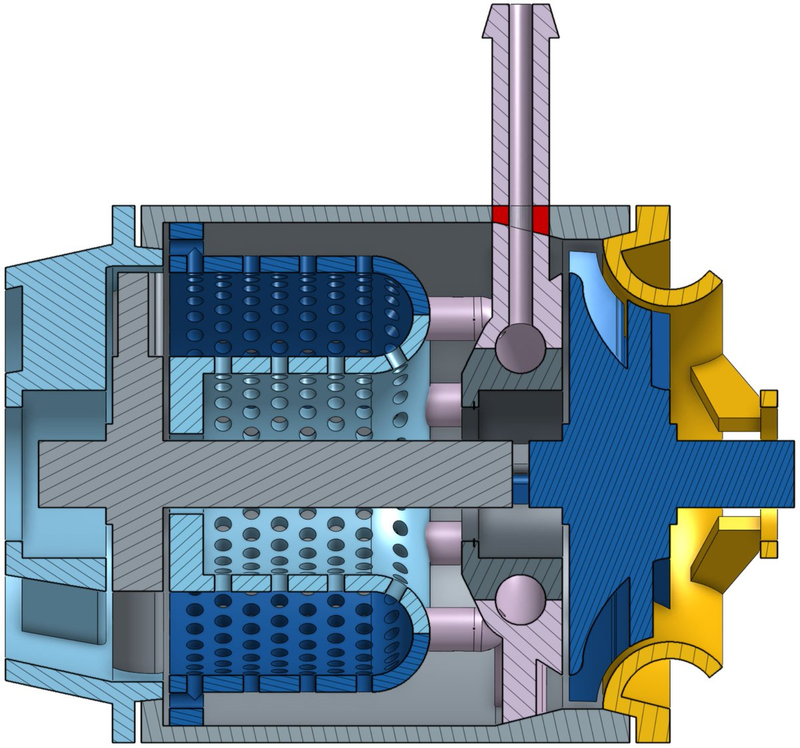 Second, in design I had neglected to include nozzle guide vanes, which meant that the turbine was really under powered. Third, the bearings *really* didn't like the environment, although to be fair it was never meant to operate for more than a few seconds. I have updated my CAD model to address these design flaws, but I don't have any near term plans to do another print. I have too many other projects to build first. If you would like to adopt this project in an intentional way, please reach out! One final comment! Over the last few years I've watched a few inspirational makers on YouTube. These very clever people encouraged me to try more ambitious projects and to document them, albeit nowhere near as well. In particular, I have loved watching Adam Savage morph from the goofy Mythbuster to a slightly curmudgeonly glimpse of my own future, only with an amazing shop and incredible collection of props. It has not escaped my attention that when I first watched Mythbusters I hadn't learned trig or calculus, my inner nerd was only just forming and, growing up in rural Australia, I was only dimly aware of engineering as a career. Since then, I've enjoyed climbing the ranks of nerd-dom and recently achieved a lifelong goal of working at NASA JPL on space robots. If I think about it, it kind of blows my mind! On social media, I've made no secret of the fact that, of my projects, I think this is by far the best bait to nerd snipe* Adam Savage. So, Adam, if you read this far I hope you enjoyed this account of the tiniest (and only) jet I ever made.